NJKidsOnline.com is the go-to resource for New Jersey parents to find boredom-busting activities and events for their kids. The website boasts up-to-date information, calendars and community boards regarding family-friendly and kids’ activities – including camps, classes, performances, festivals and much more. 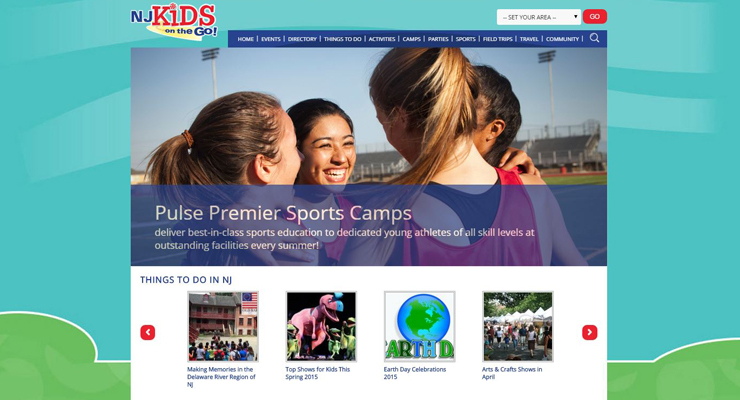 In 2014, the NJKidsOnline.com team began redesigning and rebuilding its website on Agility CMS. The refreshed website launched in early 2015. A main priority of NJKidsOnline.com’s refresh was to build an online property optimized for mobile devices. Additionally, the website’s design and usability needed to be revamped in a big way. The previous design was outdated and difficult for users to find what they were seeking out. The website’s Events Calendars and Directories needed to be re-organized and restructured in order to be easily sorted and filtered through by parents to find the content most relevant to their interests and location. 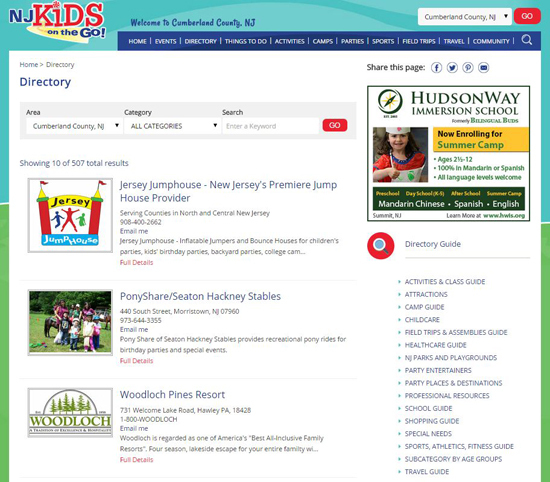 In terms of a content management solution, the NJKidsOnline.com team sought out a streamlined platform that would not present any barriers to its online team in publishing content and keeping the website up-to-date. They required an intuitive CMS that could quickly be mastered by content editors. The Agility CMS Team implemented the prebuilt Publishing Package, a solution architected specifically for online magazines, with customizations to fit NJKidsOnline.com’s specific needs. NJKidsOnline.com now utilizes a responsive design, meaning that the website now meets their mobile-friendly needs by automatically resizing and reorganizing itself to fit within all viewports (desktop monitors, tablets and phones). The website also now includes touch-friendly elements for its phone and tablet users. For example, in mobile views, the website’s main navigation menu is hidden via a hamburger menu (the three bars in the top right of the screen). When the mobile menu icon is touched, it expands to reveal all main menu items for easy-navigation and an uncluttered mobile user-experience. The website’s new design is now modern and visually-appealing. It is intuitive to navigate through, and users are able to find exactly what they are looking for within two clicks. In order to present users with the most relevant content, the website includes the ability to “Set Your Area” via a dropdown above the top navigation. Once selected, the website refreshes to display content specific to the location, like the below example of “Things to do in Cumberland NJ” homepage module. As a user navigates throughout the site, the selected region continues to inform which content is displayed. For example, the website’s popular Events Calendar is automatically filtered to the selected region. The website’s Directory, a listing that includes classes, programs and more, can also be filtered via location, category and by entering keywords. The Directory is a paid listing, and subscriptions for the advertisers that appear within it, are seamlessly managed in Agility CMS. 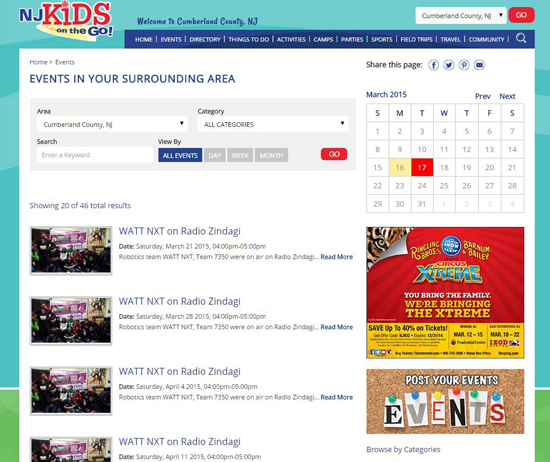 While the NJKidsOnline.com team manages and updates most of the listings, advertisers do have the ability to login themselves and edit their listing as they please. The NJKidsOnline.com team reported that Agility CMS has opened up accessibility to their online content – and it is now easier than ever to create, publish and edit content on the website. The team was able to pick up Agility CMS’s workflows and functionality after training sessions with their dedicated Project Manager. They are now able to autonomously keep their content up-to date.